SHERRI TALES: Sheryl Ann Crawford, Children's Author: Meet Author Evelyn B. Christensen and her Aba-Conundrums! Visit My AMAZON.COM AUTHOR PAGE! Welcome to my blog. Get yourself a cup of coffee or tea and let's visit. Please click COMMENTS at the end of my posts and let me know what you think. I'd love to learn about YOU, the writer, or the aspiring writer! I'm a published author, and a non-working Registered Nurse. Author of 10 books (see books in margin) & and oodles of magazine stories for kids. 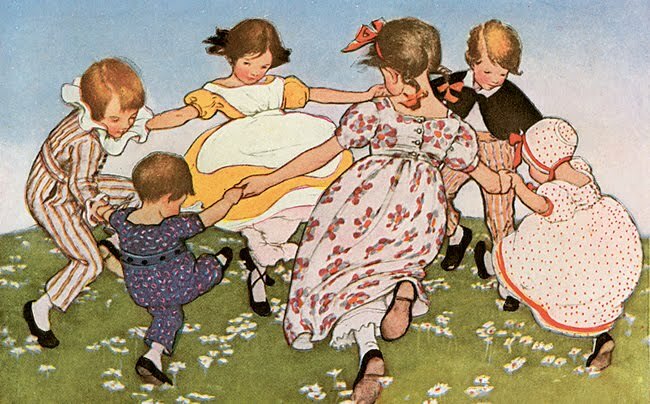 My pieces have appeared in BabyBug, Highlights, Clubhouse Jr.,and Discovery Years. My story "Kitten's Climb" is part of a Harcourt Trophies reading comprehension test booklet for use in public schools. Married to a wonderful man. We have two sons, two grand-daughters, and several rescued I put my faith and trust in God---my strength. Nancy Sanders and I wrote seven books together for Scholastic! What a blast! Check out some of my favorite Blogs & Websites listed at the bottom of my blog. Godspeed Partners with Children's Hunger Fund! Meet Author Evelyn B. Christensen and her Aba-Conundrums! Evelyn B. Christensen's book, Aba-Conundrums, is a Parents' Choice Award Winner! The Abacus is back, and for good reason! 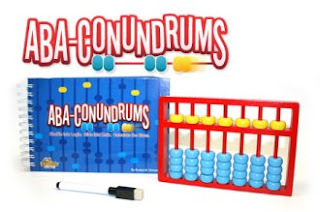 Aba-Conundrums gives logic and reasoning room to move, as kids slide their abacus beads up and down to solve 120 clever puzzle conundrums. They'll use their knowledge of numbers and a variety of mathematical skills while having FUN! Yes, FUN with math! The book includes an abacus along with the write-on/wipe-off book. ABOUT EVELYN: She is one of six children of a minister and a teacher. Ev grew up in a lively family where puzzles, games, books, and questions were daily fare. It wasn’t uncommon for someone to jump up in the middle of a meal to consult the dictionary or Book of Knowledge to settle a question or argument. Game rules existed to be revised or expanded. Ev fondly remembers the 4-board Monopoly game (laid out cloverleaf-style) that occupied the living room floor much of one summer. With such a background, along with having a passion for teaching, it’s not surprising that educational puzzles and games would be Ev’s forte as an author—she’s had over 45 of them published. She has a doctorate in math education and has taught at levels from kindergarten to graduate school. Currently she’s writing full-time. Hi, Evelyn! Thanks for allowing me to present this interview on SherriTales! EV: I'm happy to be here! SHERYL: Evelyn, how did you get your first educational book published? EV: I was very blessed. Clip-Clue Puzzles was my first book. It’d been used for several years in a couple of different classrooms before I got up the courage to submit it for publication. The first publisher kept it about six months, which as a newbie I thought was way too long. He rejected it but said I should definitely try to get it published elsewhere. The second publisher accepted it almost immediately. My real break came several years later. MindWare had been carrying my Clip-Clue Puzzles, and I emailed them to ask if they’d be interested in carrying my Coin-Clue Puzzles. Fortunately (or by God’s grace, as I believe), MindWare at that very moment was looking for someone to write some puzzle books for them! I’ve written 24 books for them since then. SHERYL: This next questions will interest those who want to break into writing for the educational market. What suggestions do you have for someone preparing a proposal for a puzzle or activity book? EV: Other authors might disagree with me, but especially for a first proposal I think having your sample pages look as professional as possible can make a difference with editors. (I think that’s one of the reasons my first book sold so quickly.) Sure, the publisher’s design people will end up changing what you’ve done, but that first impression will let the editor know you’re serious about doing a good job. You’re also making it easy for the editor to visualize your work as a book. For a first proposal it’s probably also important to try your ideas out with some kids in the intended age range for the book. What seems obvious to you may need more clarification with children. Do check, and recheck, to make sure your activities and answers are error-free. If you’re preparing a puzzle or activity book that you’re hoping will be used in the classroom, be aware of the effect of No Child Left Behind. Editors used to be much more willing to publish books which were fun, mind-stretchers. Now most of them want everything directly tied to curriculum objectives, because, they say, that’s what teachers are buying. SHERYL: Great advice! Give some tips for an author who is trying to land that FIRST educational book contract. EV: This will sound obvious, but it’s still really important to study the market. You need to find the publishers who publish the kind of material you’re creating. When I subbed my first book I subbed it to the publishers who were my favorites to buy from as a teacher—I knew and loved their books and knew my book “fit” their publishing philosophy. If you’re not a teacher, spend some time browsing through the books in your local education store. If you’ve exhausted that resource, I have a list of educational publishers on my website for additional possibilities. My second tip is to read Nancy I. Sanders’ book, Yes! You Can Learn How to Write Children’s Books. She gives valuable suggestions on this topic. SHERYL: I completely agree with you about the necessity of reading Nancy's book!It's been a break-through book for new writers. Evelyn, you include your book dedications on your website. Is there anything you want to share about those? SHERYL: That's an amazing and inspiring story. Thanks so much for this wonderful information you've provided today. EV: Thank you for letting me be with you today, Sheryl. I’ve enjoyed it and consider it an honor and privilege! Awesome interview, Ev and Sherri! What a wonderful interview. I enjoyed it very much. Excellent interview. Thanks Ev for providing useful answers and thanks Sheryl for asking useful questions. I'm so glad you enjoyed the interview. Evelyn gave some great advice. Hope it helps other writers! Thanks, Tina and Diane, for stopping by. And thanks, Sheryl, for having me here. I have such respect for you as an author, Sheryl, that I consider getting to be featured on your blog a real honor. How to write for children and teens - Institute of Children's Literature.